The Spa at Secrets in Jamaica…LOVE IT! This is my third trip here, my first was right after the opening and I couldn’t help thinking yesterday as I was strolling to the spa how much it has blossomed truly making this a first class resort! The grounds have all grown in now…with the plantings so beautiful … The walk along the pathway is both restful and relaxing. I loved hearing the birds singing as I was strolling to the spa! And the whimsical Sculpture and fountain along the way, so many touches that just add to the experience! I LOVE “Spa-ing” and getting there is part of the FUN at this property! The Spa here is not only beautiful and has many state of the art features within it, they are also staffed by very talented therapists and support staff. First I toured the Spa with Cordillia who took me to my locker and then showed me around again. Another feature that has grown into a lovely area is the Moon and Stars Garden Area just outside the Revive Resting Area on the 1st floor. Its a lovely Manicured Garden Area where they do Outdoor Sunset and Moonlight Massage Packages where you can experience the elements of nature including the sound of the Ocean! LOVE THAT! On the Second Floor of the Spa are the Therapy Rooms and another relaxing area all done in a soothing and relaxing decor. I had a Swedish Massage with Joan who I know from Previous Visits here. She is a lovely lady who made the experience magical for me. She along with the rest of the Spa Staff have a gift for transporting you to another place! When I left I felt not only Revived and Renewed but also blessed in the fact that I was here and alive. I highly recommend a visit to the Spa here! They have many wonderful treatments along with a beauty shop where you can get your hair and nails done! Also you can purchase a pass to use only the Steam, Sauna and Aqua Therapy Pool! Make sure to check them out while you are here! You won’t regret it! The Spa at Dreams Villamagna truly is an oasis of Relaxation and Luxury. The Staff there is dedicated to pampering the guests and truly do just that! After you change… you are taken to the Hydra Therapy Room that is so very relaxing there are two round Jacuzzi one with warm and one with cooler water, the steam and sauna rooms are both just off the large Hydro Therapy room. My Favorite Features are the two very largo Hydra Therapy Circuit pools! One has the Jets of water for your shoulders in fact 2 different kinds and those amazing “water beds” that are amazing…they are steel rods that are shaped like a couch and when you lie on them you are massaged by water….OH SO HEAVENLY! The other pool right next to it has a station that you stand on and the water bubbles up between your toes and legs massaging you and relaxing you so nicely! Also there is seating in that pool so you can experience Jacuzzi on your legs and back! A very nice feature of the spa is the fact that its partially open air and the view from the lounge chairs over those two pools is so tropical and relaxing along with the ambient music that play….it truly takes you away to you Zen Place! They have many Therapies to choose from both for Ladies and Men, they offer Couples Treatments also and their Therapy rooms are fit for all types of treatments. Some even have a lovely massage tub and shower in the room so you can experience a body scrub and wrap and in the same room you have a lovely shower available to rinse off! Every Detail of Luxury and Relaxation! Below is a slide show of Dreams Villamagna when I was there I enjoyed the facilities completely and had something new that is not quite yet on the spa menu but Luis the Spa Manager told me that this is something they are planning on putting on that menu. It is the 4 handed Massage. The one I had was called Ying and Yang as I had a both a male and female working on me for one hour it was out of this world AMAZING! I had 4 hand massage about 15 years ago in St. Lucia and can say that this one here at Dreams Villamagna was oh so much better! An hour of BLISS! After Ying and Yang I enjoyed a body wrap of Mexican Aloe that hydrated my skin and smelled oh so fresh and relaxed my body and senses even more! It was nice to have the shower right there in the room so I could rinse off privately with out having to travel to another area as sometimes happens in some spas. Here is The Slide Show of Dreams Villamagna Spa! LOVE IT! The Spa at Secrets Marquis Los Cabos is truly a Respite to Relax and Rejuvinate! From the Decor throughout the spa to the two lovely relaxing areas both inside and out your mind slows to a gentle pace and you start to feel at Peace with yourself! I enjoyed both of the Relaxing Areas! Outside is lovely with the Jacuzzis and the Plunge Pool that is located just below one of the Signature Waterfalls at Secrets Marquis! Inside the Relaxing Area also has a Watefall Wall Feature that has a very soothing effect while you are waiting for your Therapist. Below is a slide show from my visit to the Spa while I was there I had a lovely 80 minute Signature Aroma Therapy Massage. 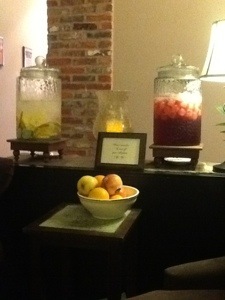 It was a lovely way to end my day… I recommend the spa and any of their treatments while you are there!